If you care about the health of your teeth. There is certain foods you can eat that will strengthen your teeth. Dairy Milk yogurt and cheese all have one thing in common. It has lots of calcium and phosphorous. That will help to strengthen teeth enamel and it will encourage re-mineralization. Another thing dairy does is it encourage saliva secretion. That helps prevent against bacteria of the mouth. It also balances ph levels in the mouth. If you are lactose intolerant then soy milk is a great alternative. Strawberries. Filled with vitamin c and antioxidants. Strawberries also help ex foliate naturally. That helps with teeth whitening. Also it removes tartar that is harmful to teeth. All that is needed is to add it to your diet or as a healthy snack. Chicken and beef. Like most animal proteins contains phosphorus. For healthy tooth enamel phosphorus is very essential. When calcium phosphorus and vitamin D is combined. Healthy teeth and bones are created. If you are vegetarian then tofu is a great alternative source of protein. Parsley parsley is known to be a great and natural way to help for fresh breath. It has anti bacterial abilities that helps to prevent tooth decay. Instead of chewing gum that is sugary. Consider some parsley. It will help with breath and also protect your teeth as sugars isn't good for tooth enamel. When we think of Vitamin K. What do we think of? It is known to help strengthen teeth enamel when combined with vitamin D. Consider foods like broccoli or Kale. Both are high in vitamin K. Or as an alternative egg yolks, pasteurized butter fermented grains and natural cured salami can be consumed. As mentioned in previous articles tea is a great antioxidant. Almost all type of tea contains fluoride that helps to protect from decay. Green tea contains polyphynol. That helps protect the teeth by preventing plaque from adhering to teeth surfaces. Also it can help eliminate bad breath. When we drink water we ensure our mouths are clean. It washes away anything that can serve as breeding ground for bacteria that is harmful to teeth enamel. After eating highly acidic foods it is advised to rinse or drink water to dissolve anything that is harmful to teeth enamel. By drinking water we also boost our immune systems. That also helps to fight gum disease and ward of tooth decay. 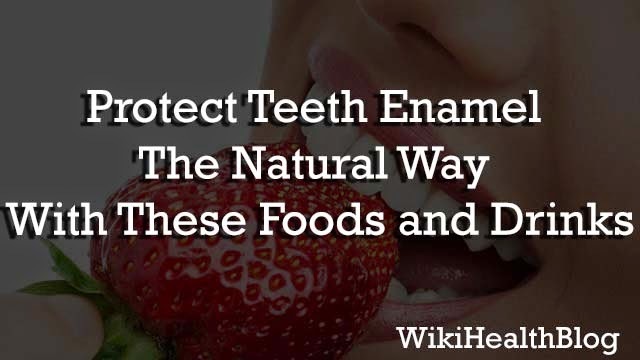 So here is a few natural ways to help protect teeth and tooth enamel. Consider this advice as it can make a great impact in a very natural way. If you have any question, feel free to ask via comments. Don`t forget to like us on facebook and subscribe our newsletter to get free updates.